As we're going to be taking a short break from the project over the festive season it might be a little while before our next update, so I just wanted to wish all our readers a Merry Christmas and a Happy New Year! I'd also like to thank all those who have offered support to the project, from our friends/fans/followers through to our direct collaborators, and I hope that next year will prove to be an exciting time for the project! Please note that although we will be taking a little break, our next networking event is scheduled for January 6th and we will remain open for RSVPs throughout the holiday period. Hello, to introduce myself, my name is Tom Stuart, and I am working with Alex Barrett and Christine Hartland to produce the feature film of Life Just Is. 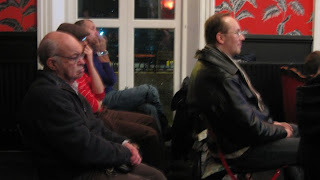 On Sunday 13th December 2009 we made our way to the ICA in Central London to read through the script with 7 magnificent actors. To hear the script read aloud brought the characters to life and threw new light on the whole story. We were extremely lucky to have a talented group of performers who brought all their experience and imagination to play in the world of the script. Not only that they were perhaps the first collective audience of Life Just Is, and as such they became critics in the discussion following the read through. Getting actors involved in the creative process is a really superb development tool that is no doubt sorely underused by the UK Film Industry. A read through usually only happens once the film has been cast and production is imminent, often very late in the day, meaning any subsequent changes may be rushed and under pressure. A film script is hugely complicated and the process of making the film is inherently collaborative, so ultimately the earlier and more generous the feedback and co-operation, quite frankly the better. Alex responded bravely to the honest but constructive thoughts and feelings of the actors. 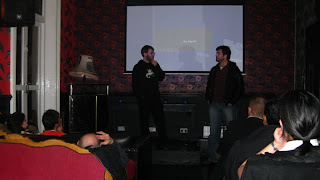 Taking the proverbial bull by the horns we met on Monday 14th at the BFI. We spent 3 hours analysing the drift of the discussion and picking apart what we felt was important, so that Alex might be best prepared for further work on his script in the light of this intelligent audience opinion. The aim is to enable a good script to become a great script. I thoroughly recommend a read through to any and every filmaker interested in writing the best script they possibly can, and as a member of the ICA you get a world class arts venue for free! An experience that is both invaluable and stylish. I think this read through has been the biggest creative boost to the project since my involvment. I am very excited by the prospect of a new draft of Life Just Is, which Alex is aiming to produce in the New Year. Indeed 2010 promises to be a great year in the evolution of Life Just Is, so watch this space. 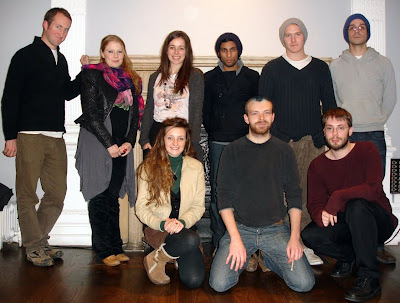 The cast of the ICA Lab with producer Tom Stuart and writer/director Alex Barrett. Back row (left-right): Tom Stuart, Nicola Raby, Rebecca Eve, Shane Zaza, Nicholas Banks, Matthew Thrift. 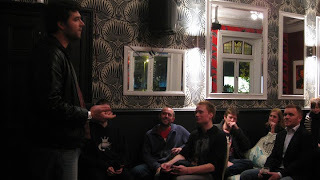 Front row (left-right): Charlotte Workman, Matt Prendergast, Alex Barrett. Last Wednesday was the December edition of our Life's Just Networking event, and what is there to say except 'What a night'?! 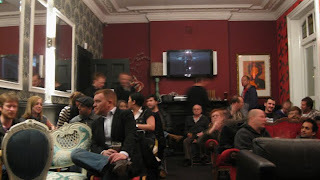 Great films, interesting QAs, a friendly atmosphere and of course amazing people. The feedback we're getting on the event continues to be extremely positive, and I'd like to give a big personal thanks to all those who come along and to those who take the time to tell me their thoughts. I look forward to seeing many of you again - hopefully along with some new faces! 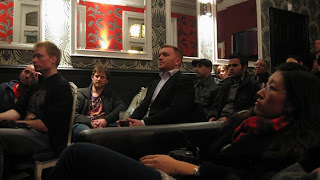 - at our next event, which will be on Wednesday 6th January. We have another strong line up of films for you, including two award winners. 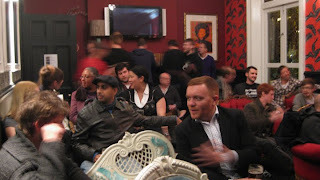 Details will be uploaded to www.lifejustisfilm.com/networking.htm in the coming weeks. 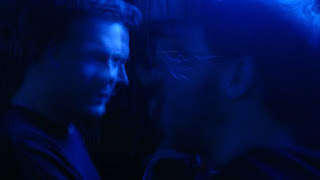 Tom and I having a production meeting before the event. Jason and I setting up. 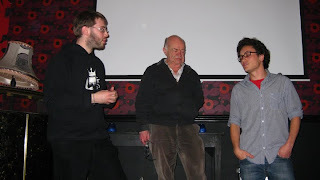 Actor Morrison Thomas (centre) and director Simon Bennett-Leyh (right) discussing their film Who Cares. 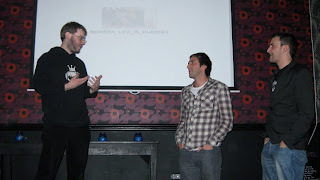 Director Will Kenning (right) discussing his film Masters of the Universe. 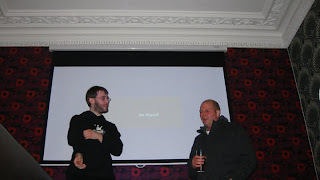 Returning director Nick Reed (right) discussing his film Whoops. 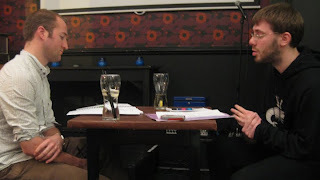 Director Daniel Gill (centre) and writer Philip Gawthorne (right) discussing their film Modern Life Is Rubbish. Who Cares actor Morrison Thomas (left) watching the QAs. Masters of the Universe director Will Kenning presenting his next project. 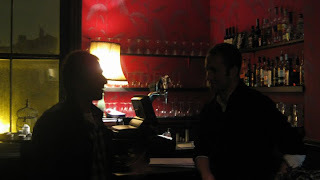 Tom talking to Modern Life Is Rubbish director Daniel Gill (left) at the end of the evening.